Is Toile Fabric for Home Décor In or Out? Is Toile Fabric in or out? I’ve been pondering this question for awhile now. I loved toile fabric so long ago. Sometimes now when I see it, it looks off, not fresh or current. Still, I’ve got toile fabric on Evie’ bed. I used buy everything toile I could find, but not so much any more. I decided to add a new toile element to my house, to see how it looked. I made a toile pillow for Elise’s room. I think the tendency when working with toile is to use it everywhere. I wondered how it would look as an accent pillow. I’ve made this pillow using fabric from Calico. I found it at my local Calico store. I used a regular sized standard bed pillow. I normally avoid sewing anything with buttons because it used to be such a bug-a-boo to do. That’s Southern talk; it means ‘a pain in the neck.’ In fact, I haven’t sewed a button hole in at least 20 years. There I said it. They used to be so complicated to make. But now, I have an attachment from my sewing machine. I put the button in the attachment, then start sewing. It makes the button hole just exactly the correct size. I honestly feel like I’m cheating! If you are sewing with an old machine, this feature alone might make it worth buying a new machine. My machine also self-threads the needle. 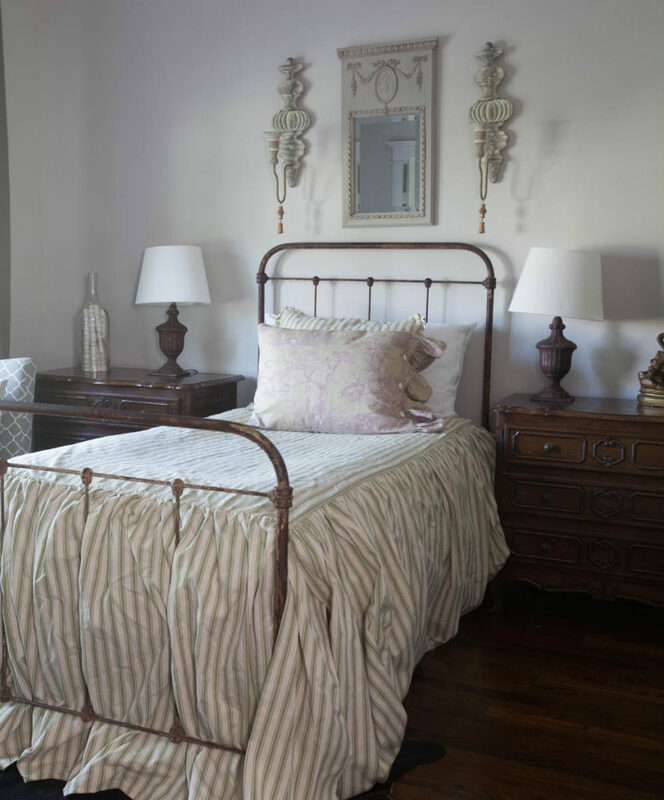 I think the toile fabric works It plays off the casual feel of the striped bedding. I like using it as an accent fabric. It’s hard to see the pattern in the photos, but it’s one of the prettier toiles I’ve ever seen. Yes, it’s lavender on a tan background. If you look closely, you’ll see I failed to catch a stray piece of thread. To answer my question, I think toile is definitely still in. It’s a classic and paired with more casual fabrics, can still look bold and on trend. I prefer the toile fabrics that have a more textured look like this one. I also prefer colors that are not too strong. You want the fabric to look aged over time. My conclusion? Yes toile still looks fabulous. Using it with lighter more casual fabrics works beautifully and keeps the room feeling fresh and on trend. I still love a toile print. It’s a classic. I found a beautiful multi colored with creams and blues and covered a chair seat for a little desk in my bedroom and will be making a throw pillow as well. Your pillow is adorable! I agree that toile is a classic. Currently, I prefer it as you have used it, as an accent. In the past, when it was used, it was often over-used. It was on everything from walls to furniture, to tablecloths, bedding, etc. The way you are using it is very refreshing. I have been using toile for years and never tire of it. I think its a classic..I mix and match it with other fabrics! I love the design/color you used on your daughter’s pillow..very sweet! Gretchen I agree with you! I think toile is like checks, they are a classic & never go out of style! Now that isn’t to say a whole room smothered in them is classic(I do think that can look dated!) but when used as accents here and there I think they are a timeless look. I have used checks(black & White or red & White rotated in & outdepending on mood & season)with muted toile prints throughout our home for 3 years. I’ve tried to change it up but I always go back to my checks & toile! Classic never goes away, it just evolves. I think the pillow is beautiful. My sewing machine is about 45 years old. Do you think I need a new one?? P.S. – I love toile and came to this site because I had the same question. I’ve got a lovely piece, enough to make a shower curtain. Black print on cream. I bought the fabric from Country Curtains years ago and never used it. The new machines do so much. It is amazing! Your fabric sounds so pretty. Isn’t it sad about Country Curtains. I don’t have a lot of curtains in my house, but they are all from Country Curtains. They will be missed! Yes, so sad about Country Curtains – I loved their stores and the catalogs too. I’ll definitely have to check out some of the new machines! I think toile is a classic and will not go away. How you use it will update the look. The pillow is lovely. I have always loved toile and think of it as a classic. My best friend and I still talk about how much we loved a red toile bathroom we saw on a Christmas house tour many years ago. It’s a wonder I don’t decorate the entire house in toile! I’m envisioning a comedy skit about a toile house right now. I love that button hole thingy for my sewing machine! My Bernina has me make buttonholes manually. Mine is 50 years old. I do have a buttonhold attachment that I could use, but I have no problems and I like the custom sizes I can create. Which brand of machine has the button – automatic buttonhold feature? Mary, it’s a Brother. You put the attachment on, then insert your button. It makes the button hole the perfect size for the button. That’s super awesome in my book. I am in love with your Renaissance Woman skills! You can write this blog, maintain a business and sew like a professional! Pleats, cording and buttons, Oh My! Love Toile and it definitely is a classic. Love that color and pattern. Yes, you do amaze me as others have said! You remind me of my own mom who was also a R woman—but you are much younger! I appreciate so much about you & how you use your gifting. Thank you! When I started your article I was so fearful that you would tell me Toile was out and then we couldn’t be friends anymore. Then you said, Yes!! Toile is still good and In!!! The sun shined at my house and life was good again. Seriously, I have a blue toilet slipper chair in a bdrm. I have the bed dressed with paisley in blues and an iron headboard. Glad it is still current! Love, love, love your pillow. The buttons & ruffle are like cake icing – beautiful & sweet. Will you make me one????? A little toile can go anywhere, in any room, & with any style. And your bedroom looks soooo inviting. Beautiful! YES!! Still LOVE Toile!! Made a great looking valance in the bathroom – deep red, blue and green on a dark taupe background. Have numerous pillows in Toile. Have also been tempted to put it on a chair or two… then changed my mind for Matalese or Grain Sack or Drop Cloth when I can find the right brand. Toile is a classic and will always be in style! Like everything, it looks best if you don’t go overboard. I like to use it as an accessory. 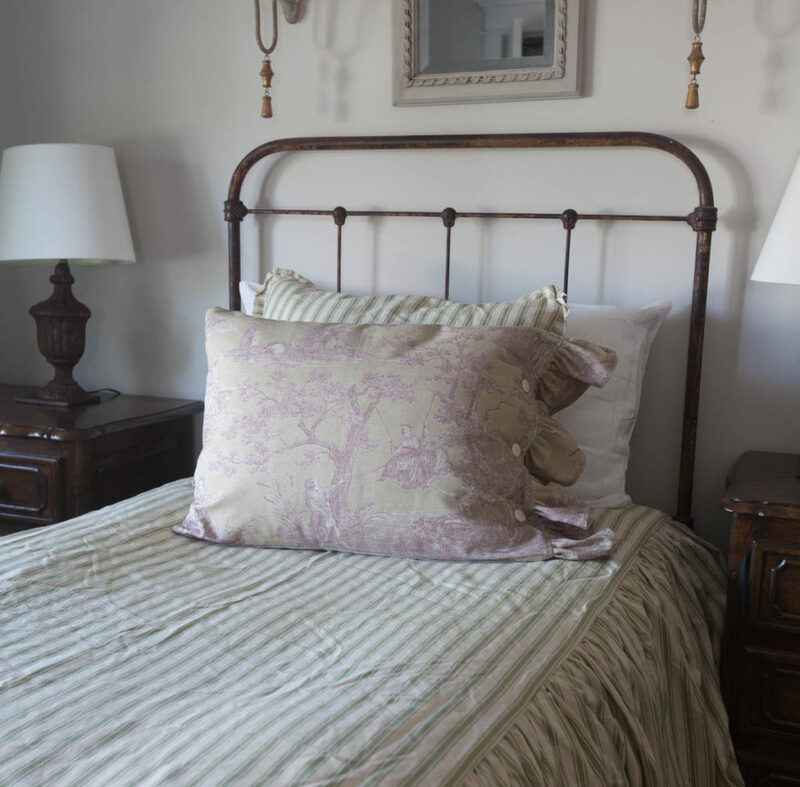 I have a toile valance and pillow in my guest room and love it! Love Toile! A little does go a long way. Like a Chanel jacket, it will never go out of style. Wish I had a Chanel jacket!!! ? Toile is definitely a classic. It has been around all of my 70 years. Love it! I love toile and I don’t care if designers are not using it. I live with vintage things, so what is “out” and what is “in” is so trivial to me. I used a pair curtains of green toile to reupholster a small Victorian side chair. It is a favored piece. I have blue toile that I use as pillows for my “summer” decor. It is a paler blue than a strong blue. I love any toile. I think toile is a classic like pin stripe and paisley. I like your combination on the bed….you loving lavendar and all. It’s classic and very pretty! I love the colors and combination with the stripes on the bed. I was just in my Calico on Wednesday and didn’t see that fabric 🙁 I use lots of lavender and soft pink, along with muted green and aqua to accent my griege interiors. that is beautiful. I love toile and have over-used it in the past and now, with a new house, I need to infuse it again; will take your recommendations to heart and probably start ‘fading’ out what toile I already have..the lavender on tan is gorgeous! Toile is WONDERFUL and a FOREVER love affair. It can never be “out”. Your pillow is so cute with the buttons. 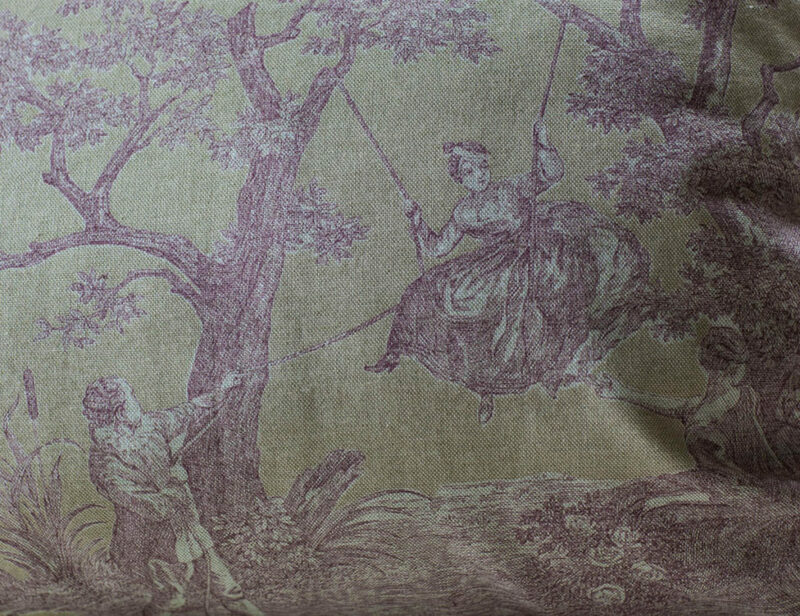 Toile has been around for centuries – no way will it ever be out of style. It CAN, however, be overdone – a touch of toile here and there looks amazing. Love toile and that lavender fabric is fabulous. I’m pretty sure I mentioned that room needed a toile pillow about 6 months ago. If I didn’t, I thought it! Buffalo check, ticking stripes, and toile just go together so well. It’s timeless! ?Nobody does it better…..? than you, Anita! I love it, my opinion on what’s in or not is something I don’t follow. I believe in marching to your own drum. Do what you like and forget about the rest of the world. Besides, who can afford to keep up with all the fades and changes that come and go. Eventually what you like will come around again. I have a husband who does not understand decorating and changes in decorating. I’ve been carrying around the same furniture etc. for years!! His head would explode if I changed anything that would involve a whole new look. LOL! I’m so grateful for your word on Toile! I love it and have it in my home in several places, yes, a classic indeed? OK, I admit that I was startled by questioning if Toile was still in vogue…then I snapped out of it…who cares? Think about how many centuries the French have been using it. Your home is your stage and you are the stage manager. If you feel comfortable in your home then others will too. Relax and enjoy that darn Toile! Anita, I was excited to hear about the button hole attachment on your sewing machine. No more saying “XG#$# “ when trying to make button holes. Say goodbye to using Velcro or snaps….hmmm. Time to investigate those new models. Thanks. I’ve been around for 69 years now—and as far back as I can remember, Toile was always in style—very classic and always in good taste. I can remember using toile in an Interior Design class combined with some very current plaids and stripes in the late 60’s. Mixing the old with the new got me an “A” in that class. Personally, as long as the upper end is still using it, it will be instill. I have loved and used Toile for years. I am not tired of it nor do I think I ever will be. I love that so many here feel the same way!! Your choice looks good and it looks fresh with the stripes!! Love it!! Yes Toile Matters! With my favorite always being black and white. And red and tan. I have my mother’s 120″ tablecloth of green and tan. Its a thanksgiving favorite. Whether it’s a sofa, chair, drapery or a pillow, I can fit it into any decor. I love Toile, to me it is like a chic Channel jacket… always in style. But mixing it up with other things I agree keeps it fresh and modern. Like pairing a Channel jacket with a pair of jeans and a funky necklace. Thank you Roxann. I agree, it’s a classic. That pattern you are showing is very pretty. Very feminine. I quite love toile, though in small doses. I have one sitting chair in a black and white toile in my bedroom, next to an 18th c chest and a bookcase. I have a matching curtain in the nearby bathroom. That little touch in a room that is otherwise basically black and white and red is just right for me. Oh it sounds so pretty!! Where did you get the bedding in the picture. The pillow looks great. Becky, I found it at Round Top. There are so many vendors there that sell new pillows and bedding, well not a lot, but several. I love toile!! I have a collection of it and pull it out every so often for a little here and there…. Lately, I found toile drapes that someone had made…they are now in our dining room….I love them. 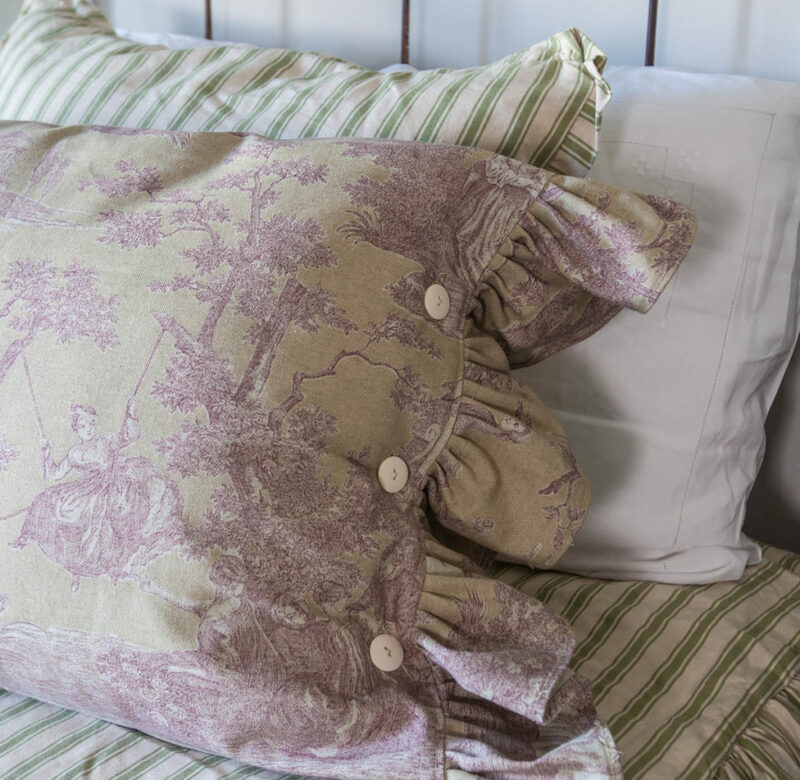 Toile is timeless…and immediately gives that French flair that is so loveable. Thank you Vickie. I love a change too. Toile is always in style – in my house, at least! 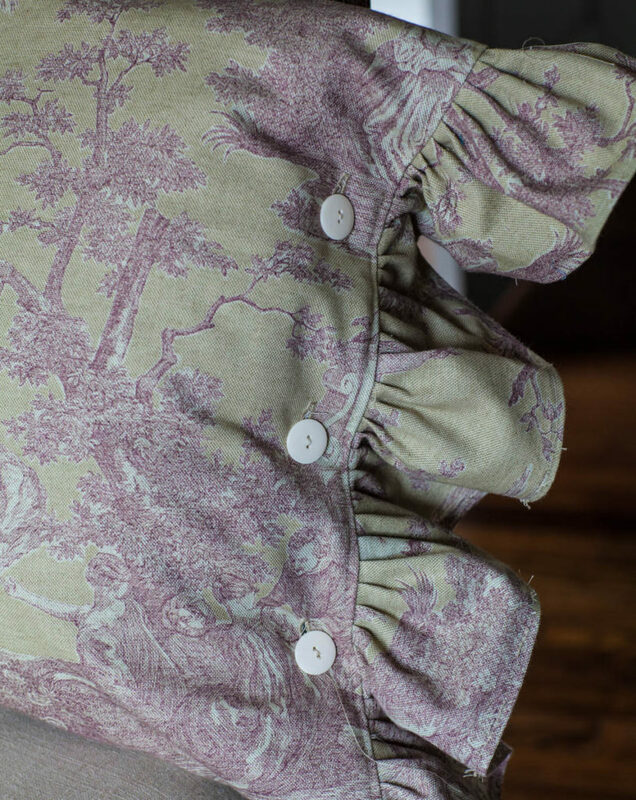 Lovely toile you chose for your pillow! It shouldn’t matter whether something is in or out. The important thing is that you like it. Although I confess to checking out trends, I realized a long time ago that following trends leads us down the path of doing what everyone else tells us is fashionable and then to craving the next trend. It’s just too expensive a way to live. Old Grammy, I say follow your own path. Some people want to do the latest thing, while others don’t care. I don’t judge people on which way they prefer to go. I just like to point out the pros and cons. And you said it well, staying on trend can be expensive. We are downsizing and will have less bedrooms so the one guest bedroom I bought a white quilt and am making a black and white toile valance and a few pillows. The walls are light gray and I am going to bring lots of plants and probably trim out the toile pillows with some apple green, I love those colors together. Just still looking around to find the right green…. this is the fun stuff in life. We will have blinds so where we live I don’t need draperies at least right away. I love toilet and have red and white in my guest room. Any pattern is never out of style if you like it! Where can I buy those pillow covers? I love toile! Just in small doses! And if it looks worn, so much the better. I got my Elna sewing machine when i was 19, I’m now about to turn 70! Have had it serviced several times and it still keeps going…weighs a ton! Has a free arm which was quite a big deal then.